Cece Degeyter (left), Head Master Roger Perry and Rygel Farr. 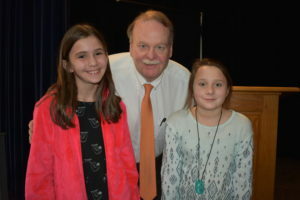 Fifth grade student Cece Degeyter claimed the top spot in Lakehill Preparatory School’s Spelling Bee on January 9, correctly spelling lobelia. * She edged out fourth grader Rygel Farr, who claimed second, going out on proboscis. Forty-five students in grades four through eight competed in the event. Henry Bennion was the last sixth grader in, while last year’s runner-up, Landry Poore, was the final seventh grader. Katie Rich was the last eighth grader to remain in the competition. Cece says she has always enjoyed spelling and studied hard over the break to be ready for the Bee. Despite her diligent preparation, she was surprised to be named champion. “It was a complete mix of shock, happiness and relief,” she said. Each year, students from across the country compete for the chance to represent their schools and communities in the Scripps National Spelling Bee. Degeyter will compete in the next round in February against winners from other private schools. As runner-up, Farr will also be recognized at the event.